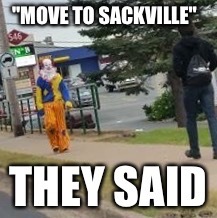 The #Sackville Clown That Terrorized Us Speaks: | Sack-Vegas!!!! I just finished talking to the young man who went for a stroll down Sackville Drive last night. He was dressed up in “full clown” and proceeded to make make many people chuckle – and a few scream and run. His name is Chris Smith and he was basically just in a goofy mood and decided to go for it. He said he received mostly honks, waves and smiles but a couple people did get freaked out at the sight of him – we all know some people are terrified of clowns. He said the cops stopped him and told him to take the mask off, he asked why a couple times then took it off and they confiscated it ($65 mask). They took his name, checked him out through their system and mentioned he had been spotted doing this over two days, which he denies. He told me he only did it the one time – last evening. Posted by Sacky on September 26, 2015 in Uncategorized. Seriously..they confiscated his 65$ mask?? Since when is it illegal to do this ? I thought Canada was a free country..not a police state. If he is not breaking any laws, leave him alone.